The Crown pendant, designed by Jehs + Laub, offers many permutations of its theme and is available in finishes including black, white, gold and polished natural alloy. Founded in Milan in 1993, lighting manufacturer NEMO represents a benchmark name, featuring the designs of some of the world’s most famous architects and designers. Federico Palazzari, the founder of Omikron Design, recently purchased NEMO from the Cassina Group. He has since widened the scope of NEMO’s collection and expanded on successful lines. 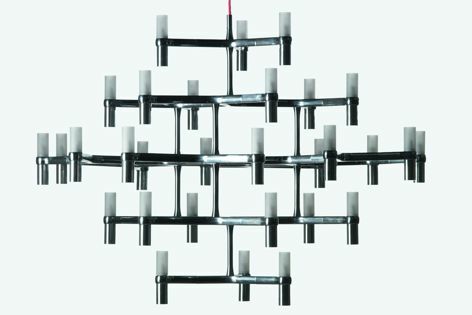 One of the most versatile and interesting collections of pendants is Crown, which offers chandeliers in diecast aluminium and sandblasted glass diffusers. 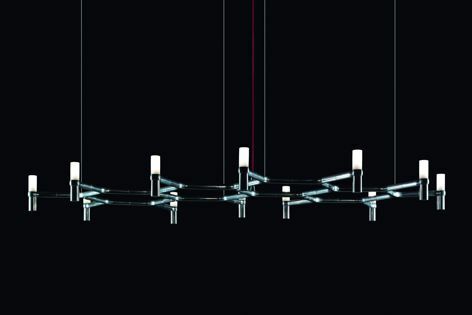 The Crown pendants are available in halogen or LED and, as they are modular, they offer many permutations of the theme. The Crown pendants are now available in black, white and gold as well as the original polished natural alloy finish. A red cable is available with the Minor and Major versions (with the exception of the gold-painted finish). All other versions have a transparent cable. The Crown pendant collection was designed by German design studio Jehs + Laub. Markus Jehs and Jürgen Laub set up Jehs + Laub in 1994. Year by year they have expanded their cooperation with international brands such as Cassina (NEMO), Fritz Hansen, Knoll International, Renz, Stelton, Davis, Schönbuch, Cor and Wilkhahn. Jehs + Laub designed the master concept for the Mercedes-Benz worldwide showrooms, as well as numerous interiors and exhibitions, such as Suite 606 at the world-famous Icehotel in Sweden. Another NEMO stand-out is the Masters collection, which features licensed original lighting by celebrated mid-twentieth-century designers including Le Corbusier, Charlotte Perriand, Franco Albini, Kazuhide Takahama, Vico Magistretti and Roberto Menghi.